T. Williard Fair, President of the Urban League of Greater Miami and Chairman of the Florida Department of Education, right, with Miami-Dade County Public Schools Supervisor Dr. Shirley Johnson at PAIRS class at the McDuffie Center in Liberty City, Florida. Strong, nuclear families are the foundation of revitalized communities and the lives of children, T. Williard Fair, President of the Urban League of Greater Miami, said yesterday to the Liberty City Elementary School faculty members participating in their second week of PAIRS relationship skills training at the organization’s nearby McDuffie Center. Fair is also chairman of the Florida Department of Education. While acknowledging the educators and support staff for their dedication to youth, Fair highlighted the critical role two-parent families must play creating an environment that supports the growth and success of children. 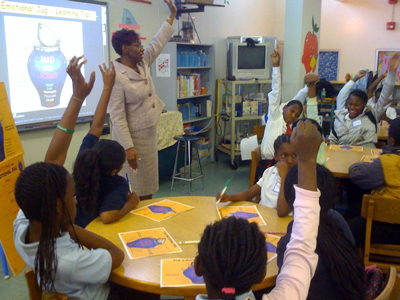 Dr. Shirley Johnson engages Liberty City Elementary School students in a PAIRS exercise for understanding and expressing emotions. Parents of fourth and fifth graders are attending Saturday morning classes offered at the school. Dr. Shirley Johnson, Miami-Dade County Public Schools Regional Supervisor, responded that Mr. Fair’s comments reflect the goals of programs being offered by PAIRS Foundation to the parents of Liberty City Elementary School’s children and nearly 1,000 other adults and teenagers who participated in PAIRS classes during the previous year. 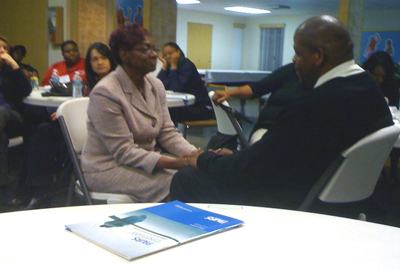 Dr. Shirley Johnson practices PAIRS Emptying the Emotional Jug exercise with Brian, a 29-year staff member of Liberty City Elementary School. 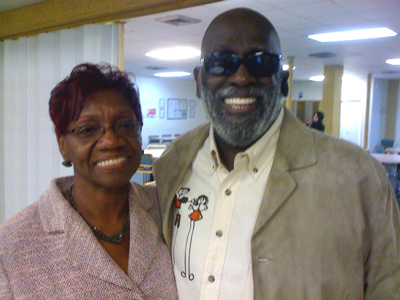 “PAIRS classes make a lasting differences for the participants, including many whose ability to create and sustain healthy interpersonal relationships with peers, spouses, and within marriages and families is critical to their success in school, the well-being of children, and the future of our neighborhoods,” Dr. Johnson said. She praised PAIRS team members for their success working with diverse populations within the schools, including delivery of classes in English, Spanish, French and Creole. “Your organization’s innovative approach to relationship skills training was well received across highly diverse audiences, from expectant teenager mothers, Haitian and Hispanic immigrants, to teens and adults who face enormous challenges in their daily lives,” Dr. Johnson said. “From our previous experience with PAIRS, we have every reason to expect positive, enduring benefits,” she added. Seth Eisenberg, President of PAIRS Foundation, said the organization is able to deliver relationship skills and marriage education classes to South Florida’s high school students and adults as a result of grant funding received from the U.S. Department of Health and Human Services, Administration for Children and Families. Mr. Eisenberg said in addition to the Liberty City program, classes are beginning in local Hispanic and Haitian churches. PAIRS Foundation, a 501(c)(3) nonprofit, is one of the nation’s oldest and leading providers of relationship skills training. For more information and a schedule of upcoming classes, visit www.pairs.com or call (877) PAIRS-4U (724 7748). Later this year, several thousand marriage and relationship skills educators from across the nation will gather in Orlando, Florida for the 14th Annual SmartMarriages Conference hosted by Mrs. Diane Sollee. Learn more at www.smartmarriages.com.